Monotech wordpress template is a clean and minimalist, but not simple wp design. There are only 3 colors prevailing, white, black and baby blue (links). The header is black with pages links on top and blog tile in the center left. The main content area is white and located between two sidebars. Both sidebars are wordpress widgets compliant. The right sidebar contains a google adsense placeholder which by default points to public service ads by Google. 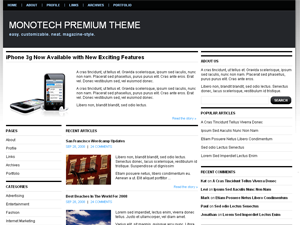 Monotech wordpress theme was designed by Chiq. Mystic Fire wordpress theme is a gray and green 3 column wordpress design. 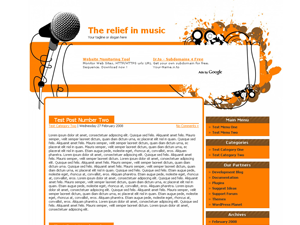 The header contains the title, sub title, pages buttons and some minimal artistic graphic. Followed by the main content area on the left (with great post title) and two sidebars on the right. The middle sidebar has a placeholder for google adsense advertisment banner and the right sidebar supports wordpress widgets. With wordpress widgets you can configure the sections you want to appear in the sidebar. Just login to your blog’s admin area and check “Widgets” under the Appearance tab. Mystic Fire wordpress template was designed by Rui Figueiredo. Aerodrome wordpress theme is a nice 3 column design where the blog owner can chose among many background graphics. This wordpress template was designed by Joe Fischler. you like most. Save options. 1.) Get the image you want. Size it to 1024px height to make it fit also for larger screens. JPG-Files with lower quality ensure fast loading times – quality doesn’t need to be too high in browsers. folder of the theme. If you want to keep the standard default.jpg, rename it before you copy your image. don’t care for the preview thumbnail as it still shows the standard default image. Save options. 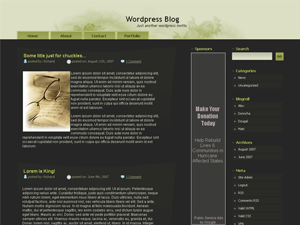 SoDelicious 2.0 Green wordpress theme is a clean and beautiful light green wp skin. 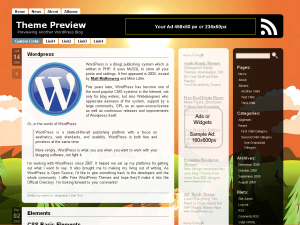 This is a 2 column, Web 2.0 wp template with placeholders for google adsense (or is it google adwords). The header contains the pages links (upper right corner), placeholder for animated banner (left corner) and google adsense (middle). The sidebar is on the right side and is wordpress widgets ready. Just above the sidebar there is the search function. Main content area is on the right side and is plain white with gray text. There is a date tab next to each post. Sodelicious 2.0 Green wordpress template was designed by web2themes.com. The footer contains recent posts, recent comments and google adwords placeholder. A uniquely designed wordpress theme, the Cashflow101 is a completely dark blue colored theme with a blue pattern as the backdrop. It is a two columned fixed width theme that comprises of a distinct header, sidebar and a large content area. The header of the theme is huge and distinct with sharp edges. The header features the graphical designs of Dollar and Euros which thus highlights the name Cashflow101. 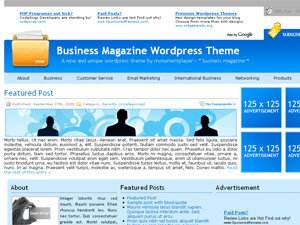 The header makes the theme simply perfect for the business or money oriented blogs. The sidebar blends with the backdrop and features the white colored fonts in the sidebar titles. The content area of the theme has a distinct area for the post title. This stunning theme was designed by designed.nu team. Designed by webhostingrally.com, this charismatic and alluring website has an attractive looking header featuring a very striking well designed apartment. The theme is made on a grey base with various shades of grey used all through the theme. This is a Google Ad-sense created two columned fixed width wordpress theme simply appropriate for any interior designing related or real estate blog. 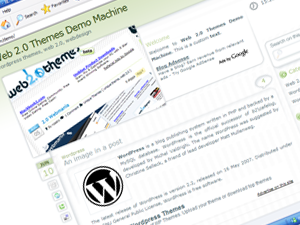 The theme has a large content area and a distinct sidebar with sharp edges. The content area of the theme displays the latest updated posts, comments or articles, while darker grey colored sidebar displays the links for the various other posts posted to the website. The sidebar title has a dark grey colored pattern that distinguishes it from the rest of the theme.